Seeming as if everything they touch turns to gold, American duo Sevenn have taken the dance music industry by storm and have embarked on an endless journey into the kingdom of electronic symphony. Over a span of two years, brothers Sean and Kevin Brauer have unleashed their wild potential across some of the world’s biggest festival stages, as well as within every original and collaboration track they’ve released. Launching out with a spot on stages ranging from Lollapalooza Brazil, to Creamfields, to Thailand’s BONE, to Face Club in China, and to the mecca of Tomorrowland, Sevenn have already set the bar high in what is possible to achieve within the genesis of one’s career as an artist. With such extravagant live performances already in their repertoire, it is no surprise dance music fans across the globe have caught glimpses into the world of Sevenn, and have fallen in love with their heartfelt presence, adventurous sound, and thrilling future as DJs and Producers. After meeting Brazilian icon Alok in Portugal 2016, he became a sort of musical guru for Sevenn. 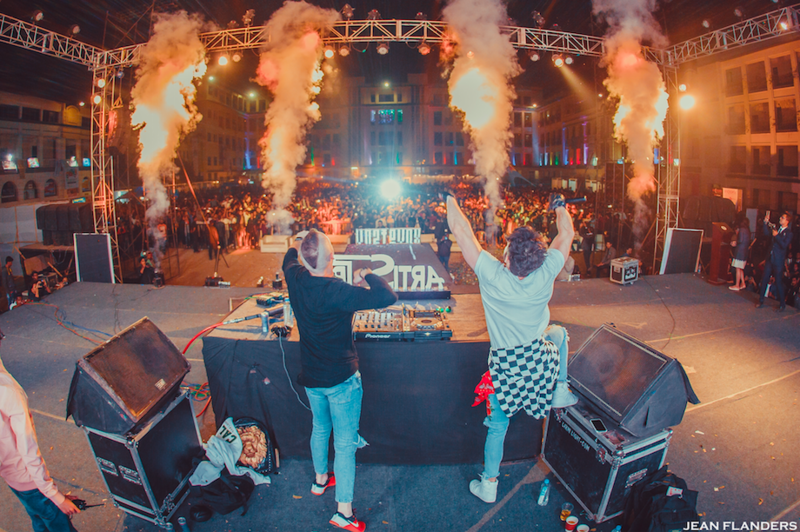 Without hesitation, the pair gave it their all in teaming up with Alok for smash single “BYOB,” which rapidly climbed charts around the world, sparking mass amounts of attention and support for the new duo. Quickly following this epic collaboration came what is now one of the biggest anthems in dance music: the almighty “BOOM” with Gucci Mane and legendary DJ/Producer Tiësto. The Dutch maestro has thrown down “BOOM” countless times since its release, commanding tens of thousands of fans into the best mayhem imaginable every single time. Recently reaching over 50 million streams on Spotify, the song has shown relentless power from Sevenn, who are using this as adrenalizing fuel to break through boundaries like none other. Sevenn has been in a constant state of creating and producing, releasing track after track that build up their sound and style. Showcasing one of their most dominant sounds yet, Sevenn is already straight rocking with their newest single “Hello Moto,” an original track that has fans begging for more and hits hard at every live performance. Garnering support from all sects of electronic music from Oliver Heldens, Martin Garrix, Sam Feldt, Diplo, Timmy Trumpet, Axwell /\ Ingrosso, Fedde Le Grand, W&W, Hardwell, and many more, these visionary brothers have their sights set on reaching top heights within the international empire of electronic dance music. Check out our interview with Sevenn to hear about their musical inspiration, studio time, summer highlights and more! The Nocturnal Times: Let’s start out by discussing your origins with music – how did your passion for electronic music develop, and what made you decide to pursue the industry together? Sevenn: Quite the story but I’ll keep it short! Sean started djing at underground raves when he was 16 while I (Kevin) made progressive symphonic Disney metal. Back in 2012, we messed around with dubstep and told each other “We could make some really cool stuff if we wanted too” but quickly dismissed the idea until 3 years later. The Nocturnal Times: Tell us about the evolution of your sound and style, and how it got to where it is today. Are there any artists in particular that have helped inspire this? Sevenn: The sound kinda came out of nowhere, mostly Sean’s wild and wacky invention with influences from progressive trance (Sesto Sento, Day din, Astrix) We started messing around with heavier more festival sounding songs and that’s the strange, yet creatively positive point we’re at now. The Nocturnal Times: Your collaboration with Tiësto and Gucci Mane on “BOOM” is absolutely sweeping through the scene, reaching a spot in the Billboard Top 20 Dance Chart and living as a major anthem right now, especially at festivals. How did you all come together for this track? Sevenn: Our friend/spiritual leader Alok sent a really rough sketch to Tijs (Tiesto) and we worked on it from there! Tiësto’s vision is so unique, it’s like he can see into the future and guess what dance floors all over the world are gonna want to thrive to. The Nocturnal Times: After such a successful collaboration, who are a few artists you hope to team up with in the future? Sevenn: It’s our dream to collab with Martin Garrix, Zedd and The Chainsmokers. They’re all such fun loving guys, I bet we could come up with something quite exquisite/eccentric over a couple of beers and cold pizza. The Nocturnal Times: Can you walk us through a day in the studio for you? What does it look like when you’re beginning a new track? Sevenn: Believe it or not we are rarely in the studio together, mostly because we’re so different and have such unusual styles of producing. We prefer to be in our separate corners first, then get together and exchange ideas, fight about mixing techniques and nerdy, useless time wasters like why to use or not use 8 compressors at the same time or why oversampling is overrated lol. The Nocturnal Times: After several years of touring and playing shows around the world, do you have a certain memory of a specific crowd, festival or club performance from the past that sticks out as a favorite? Why? Sevenn: India is definitely the wildest crowd we’ve played for. They’re just so absolutely passionate about living the moment, it’s as if they forget reality while you’re playing and in turn makes you forget reality. That exchange of energy is what we live for. We played a college in Kolkata that was so insanely wild, best vibe ever! The Nocturnal Times: The hype is beyond real for your new single, “Hello Moto.” What can you share with us about the inspiration behind this track? Sevenn: We’re always looking to make club music that can be played at small clubs, festivals, house parties, sweet 16’s; heavy yet sophisticated. Such a fun song to work on, one of the most powerful sounds we’ve come up with too with only 3 channels of synths on the main drop. The Nocturnal Times: We know you’re gearing up to play the V Sessions/Youphoria stage at Tomorrowland – how does it feel to return to the mecca of all festivals? Sevenn: So surreal, about two and a half years ago we didn’t have a penny to our name, but just enough for a few beers. As we were drinking we would watch Tomorrowland videos. I remember leaning over to Sean saying “dude, one day we could actually make it there.” To see our names on the flyer is a tear-jerker. The Nocturnal Times: In addition to Tomorrowland, what are some of the highlights of your upcoming summer that you are looking forward to most?